When we last left you in December of 2014 (http://blog.statemuseum.nd.gov/blog/why-we-save-them) we were approaching the 2015 Legislative Session, hoping for a generous appropriation to further the restoration of the historic Stutsman County Courthouse –the oldest courthouse in North Dakota. Rescued in 1985 by the State Historic Society, this project is over 30 years in the making. Fast forward one year, and we are very pleased to offer an update and an insider’s look into the restoration process. In August of 2015, work began on the installation of new restrooms, an electrical system update and the restoration of two offices on the main floor: the Clerk of Court and Auditor’s Offices. 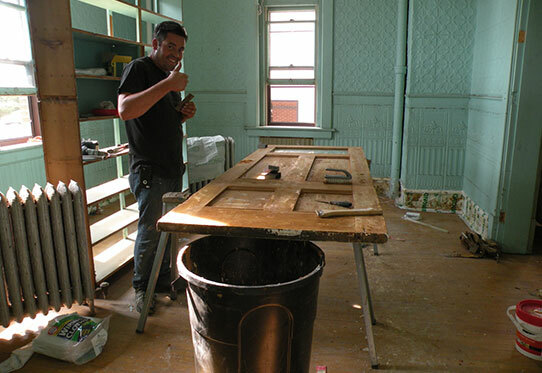 Ryan Goodman, project manager for RDA (Fargo), is stripping a historic door of several layers of paint. The existing (non-historic) restrooms were demolished—revealing several layers of 100-year-old wallpaper in the process. The tin was restored, fluorescent lights removed, and the room split down the middle in preparation for new facilities. 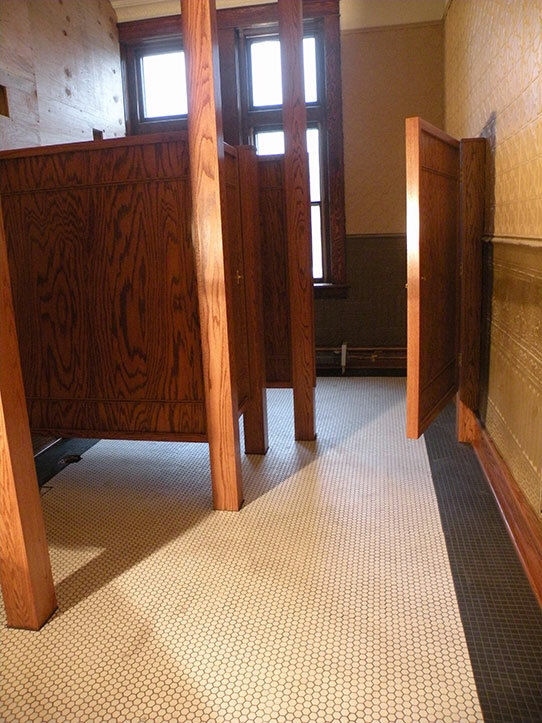 Custom wood partitions are built on-site for the new restrooms. The Historic Clerk of Court’s Office before and after restoration. 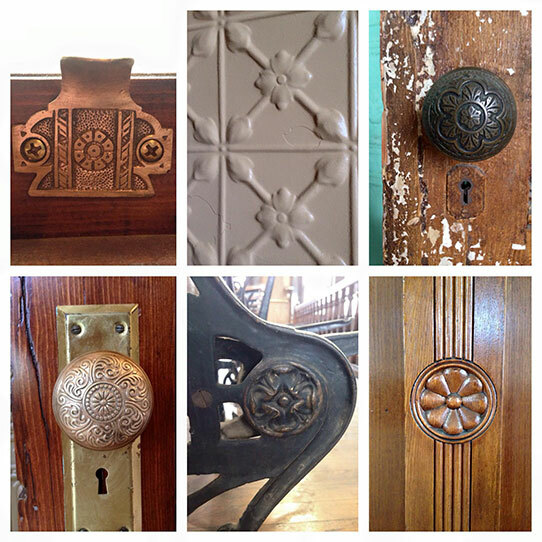 Custom doors were built to match the existing historic doors, the tin was repaired and painted, and all the woodwork was stripped down and completely refinished. 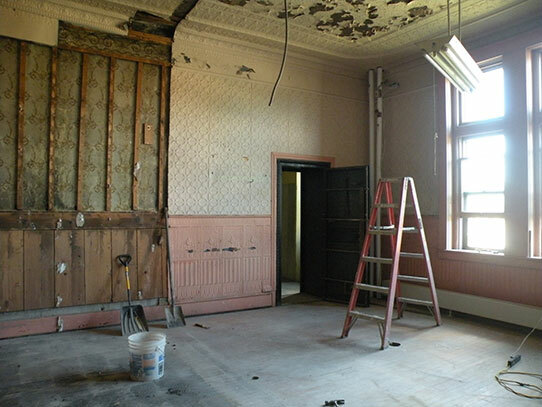 The historic Superintendent of Schools/Auditor’s Office before and after restoration. Just one of many reasons we adore this building—as the restoration continues, we are finding that it is completely covered in roses! 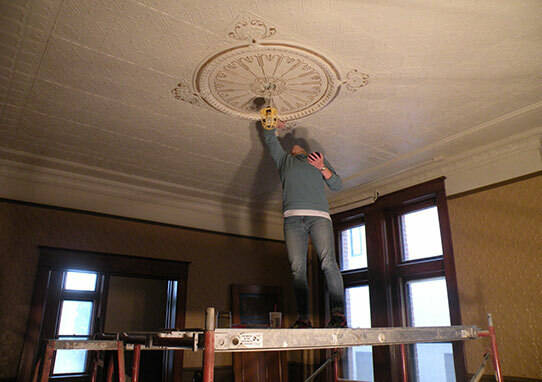 Historic Sites Manager Guinn Hinman paints the ceiling medallions a historically accurate gold. As of publishing time, the restrooms are nearing completion and work is beginning on the main floor hallway and historic Sheriff’s Office. We are adjusting to the novelty of having electricity and running water! Stay tuned for further updates in the coming months and more information on our Open House scheduled for May 14, 2016. For more photos and information, please follow our Facebook page!